Fourth Row Center: Film Writings by Jason Bailey: In Theaters: "American Casino"
The title is explained right in the opening sequence. The thesis is that the investment bankers and insurers who (initially, anyway) reaped the benefits of the mortgage market were moving around questionable markers and credit-default swaps like chips on the table. “I don’t think people realized that they were in a casino,” an expert notes. We’re then shown that notorious clip of Phil Gramm, scoffing at this “nation of whiners” and our “mental recession,” before traveling back to December of 2000, when he co-sponsored the Senate version of the notorious Commodity Futures Modernization Act. 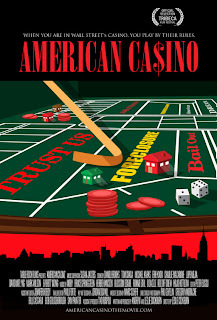 The film’s first act is primarily spent on Wall Street, examining how that deregulation enabled the “casino” to go into business. Director Leslie Cockburn talks to numerous experts, gets some candid commentary from an (anonymous) former Bear Sterns employee (“You have to follow the money,” he advises), and shares some shocking internal emails from the S&P, detailing exactly how diligently they were rating those bonds with all the dodgy mortgages in them. This section is smartly edited and mostly clear—Cockburn does her best to keep the language plain, although the film does occasionally get bogged down in the jargon (and the decision to occasionally use on-screen text during interviews confuses more than it helps). We then move into the more personal stories of those who were hurt worst by the mortgage crisis (thankfully, Cockburn doesn’t trot out the tiresome “Wall Street/Main Street” meme). We visit Baltimore, where block after block of boarded-up row houses (a familiar site to any of us who watched The Wire) serve as powerful symbols of the city’s brutal housing market. The process of “reverse redlining” is explained—basically, the targeting of minority and elderly homeowners for financing or refinancing at less desirable, subprime rates that ultimately add up to unmanageable debt and foreclosure. The numbers are startling: according to the film, minority borrowers were 3.8 times more likely to receive a subprime loan, while 61% of those who received subprimes had qualified for a prime rate—they just weren’t given one. This section of the film is not about the numbers, though. American Casino’s most effective scenes are those where we’re told the more personal stories—they’re the ones that make it real and tangible. In a heartbreaking sequence, a high school teacher named Denzel takes the camera crew on a tour of his foreclosed home, which we see being auctioned (to an audience of one) on the courthouse steps that very day. We’re then shown exactly how his mortgage became one of the giant pools of money. “Nobody told Denzel that he was a chip,” we’re told. We meet other families who have lost or are losing their homes, and talk to counselors and other experts with anecdotal evidence to refute the “they knew what they were getting into” arguments of the Santellian blowhards. We see housing department crews as they board up more row houses, which have become inhabited by squatters. And lest we infer that only the poorest Americans have been affected, we visit upscale communities in places like Stockton, California that have been ravaged by foreclosures. Cockburn doesn’t push in these segments, or tell us what to think. More often than not, she lets the pictures and the people speak for themselves. The only real structural problem is that the film is occasionally too ambitious, getting off on tangents that are of interest but ultimately don’t move us the way the rest of the film does. Some of this is valuable context, but what are we to make of the sequence at the end, where we see how untreated pools in abandoned homes are drawing mosquitoes that may carry the West Nile virus? It’s gross, yes (as are the big close-ups of rats floating in the pools), but it’s a strangely secondary matter to deal with so close to the film’s conclusion. Cockburn’s use of music is sometimes problematic; the many Moby cues in the first half of the film are atmospheric and appropriate, but the original hip-hop songs from Baltimore artists about the housing crisis just call attention to themselves (they’re too on-the-nose), and the sequence where the bailout and AIG hearings are chopped up and scored with Herbie Hancock’s “Everybody’s Broke” is a groaner; it’s too damn cutesy for a serious picture. "American Casino" is currently playing in limited release.